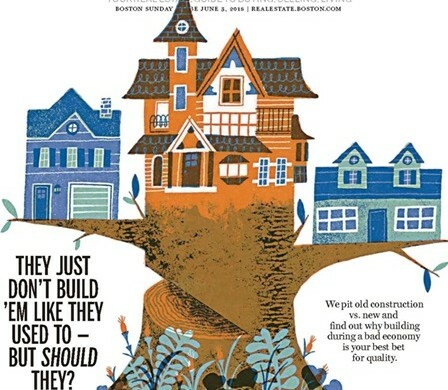 Our President David O’Sullivan was recently featured in The Boston Sunday Globe article by Jon Gorey | Globe Correspondent which talked about the differences in building styles & compositions of New England homes over the past few decades. Are you someone who has always appreciated the craftsmanship of old New England homes but never knew the specific intricacies? This piece gives a perspective of the differing practices between today, for better & worse, and the romanticized homes of the late 19th century. Modern technology does not necessarily make buildings better or last longer, often nowadays the wood being used for homes is much younger & less sturdy compared to hundred year old wood that has been used in other time periods of New England building. Craftsmanship is something that should be cherished. In times of building booms, quality often falls compared to building slumps, as less qualified craftsman are available. Adaptability of a building is often a greater detriment of its survival than when it was created. There are periods of architecture such as the 1950s & 60s where the buildings are just not as adaptable compared to some older homes such as Victorians.